Oh, hey! I haven't written here in a while, but I'm popping in after lots of thoughts came pouring into my head in the shower. I always do some of my best thinking in the shower. So, I gave it to myself. In the last month, I've moved across country from Vermont to California, wrapped up things with my clients in my local practice, and started a new job (in the eating disorder field as well). I will still be taking a handful of online clients for one-on-one nutrition therapy or intuitive eating work. I'm still settling after a big state of overwhelm and this transition state - that I'm still in until we move into our new apartment and start really settling in out here. We got rid of so much of our stuff - furniture, clothes, random stuff I wasn't aware I had. For someone that isn't a big hoarder, I was still shocked by how much physical stuff I had. 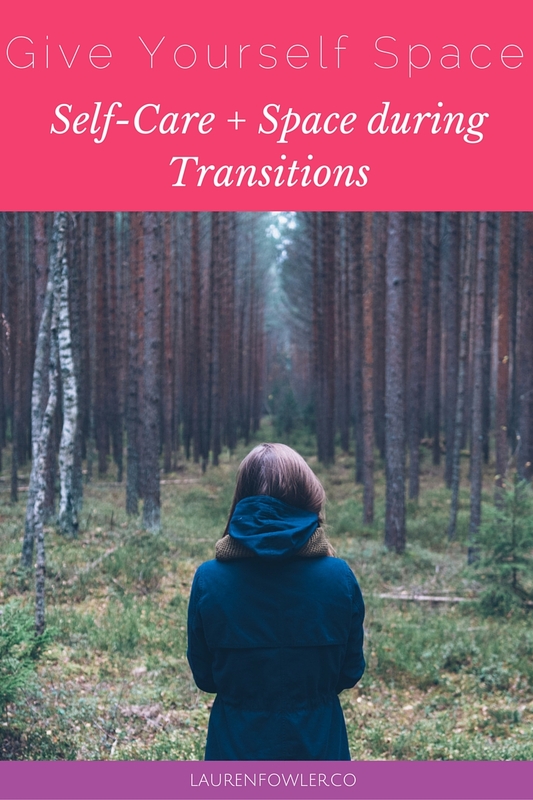 Beyond the physical, transitions always bring up the mental and emotional patterns that I cling to in times of change. Some of these I'm well aware of, while others are new to me. One of these is trying to do it all. In the past, I would have tried to do it all and see all my clients, continue writing, and work on my new course (put on pause for now but still working on it), and moving. My heart told me that wasn't how I wanted to spend my last few weeks in Vermont. Instead, I went to lots of yoga classes at my favorite studio, went out for margaritas and yummy food with friends, and spent time with the amazing people in my life. When I got out to California, the same thing happened. I didn't want to spend my first week inside writing blog posts, so I took the time to explore. Luckily, my first day here was gorgeous and warm, so I went to Santa Cruz for the day and got some sun on the beach! While in the past, I would have pushed myself to continue doing all the things on social media and blogging, I didn't have the space or energy. There's always going to be time to write, and for now, I prioritized adventures and the people I love in my life. Self-care stayed solid too. I naturally found myself turning to a slower yoga practice, morning meditation, and journaling because these practices keep me grounded. I craved space to myself to process all these changes before sharing it with everyone. I'm naturally more of a private person, and while I love sharing here and on social media, I have to process the emotions and experience first before sharing it. In times of transition, I find myself going inwards and needing more basic self-care like tuning into my nourishment, sleep, and taking care of my whole self - physical, mental, emotional, social, and spiritual. While this is my experience, I find it also applies to eating and body image. Giving yourself space consistently is so important. Too often, we live lives packed with work, commitments, exercise plans, diets, and social events that we barely have any time for our own company or self-care. It doesn't mean you have to disconnect fully for a week-long retreat, but it does mean tuning into your needs throughout the day to check in with what you need. This may be as simple as spending 10 minutes in the morning meditating, journaling, or reading, or it could be turning off email and social media for the weekend. It means getting comfortable with your own company and whatever comes up there - like those uncomfortable emotions, body sensations, or feelings. You could explore this with a therapist or on your own through a meditation or other healing practices. It means prioritizing yourself and your heart's desires over what you think you "should" or "need" to do. While yes, we all have obligations, and I'm not saying you shouldn't pay your bills or go to work. I am saying that something's gotta give, and ditching a workout for a day at the beach may be what your heart is craving that day. That's self-care and emotional nourishment (and lots of Vitamin D for your skin!). When your needs are ignored - and there's no space for YOU in your life - that's when disordered eating patterns or body image thoughts may creep in. It's easier to try to control your food or body when you're feeling anxious or exhausted in your life than to look at the underlying patterns and beliefs. Your needs - physical, emotional, mental, social, and spiritual - are all important. Nourish yourself with self-care of all types. It's just as important to nourish yourself with food, as it is for giggly girls' nights, a beautiful sunset, or cozying up with a book and a cup of tea in bed. If you need space in your life, take it. There's no need for guilt. You deserve to acknowledge and meet your needs, whatever they are. PS: If anyone's in the Bay Area, give me ideas of what to explore! Hikes, yoga, restaurants, wine tasting, adventures....?